Keaveney is currently a senior at BSU, majoring in math and fine arts with a concentration in painting. Keaveney says her love for art has grown alongside her over the years. An artist that has inspired her ever since she was a child has been Claude Monet because of his ability to b a e able to beautifully capture a landscape in his works. She hopes to continue a profession in art because it is where she feels most herself. She recently sold her first piece after putting it in a gallery which she said to be a huge confidence booster. Keaveney would love to sell more pieces in the future and travel to get her inspiration from all over the world. 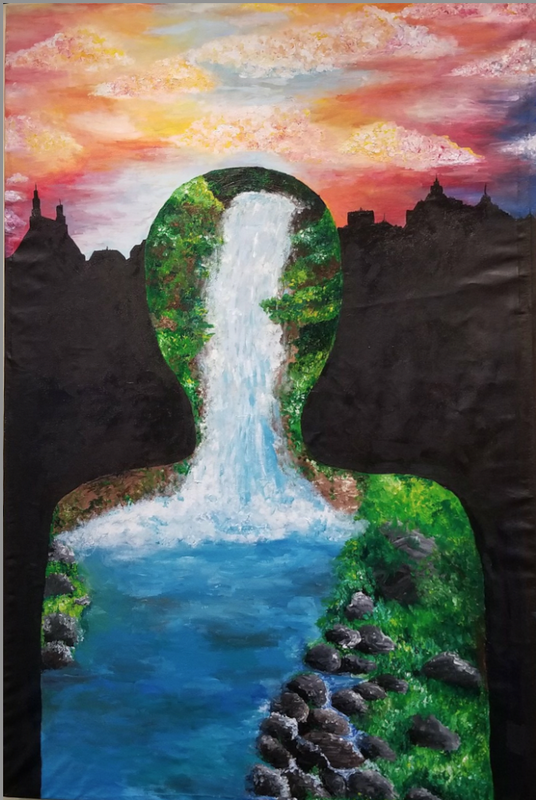 This detailed artwork in the photo is a piece by Keaveney called “The Beholder.” Keaveney says, “My inspiration for the piece was to highlight the beauty of nature and the beauty of urban life. Everyone has their own definition of what they find beautiful. It is up to the viewer to realize which scene they view as their preferred beauty.” Her artwork is captivating and thought-provoking because it allows the viewer to engage with the piece.